Here’s a fun & portable DIY kit for kids to make a jellyfish craft. Perfect for taking with you to do on a beach trip, as a birthday party activity & favor, a summer craft, or ocean unit lesson! 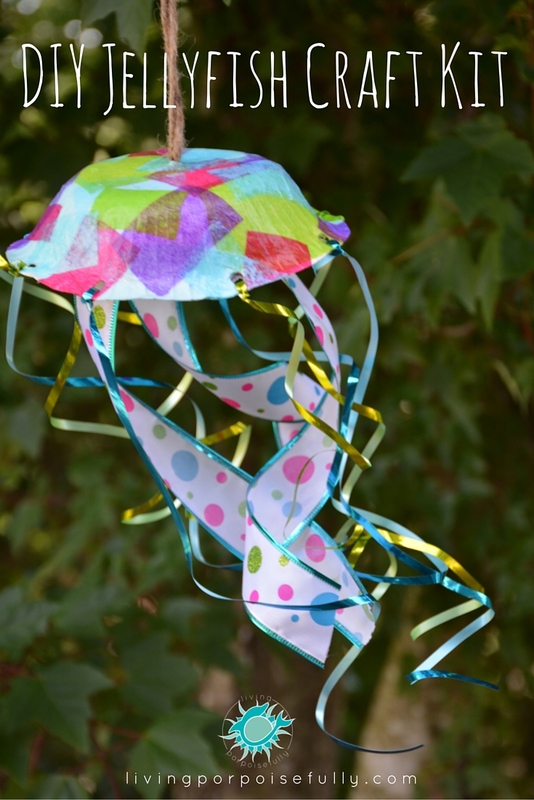 This Jellyfish Craft Kit is a fun way to get in a summery, ocean kind of mood! We came up with the idea to make individual kits for the kids to use during an “Ocean Fun Day” outreach event with 2nd graders. That way, everything would be ready to go for the kids to all make their own jellyfish together! Putting all of the supplies together in a “kit” ahead of time really makes things simple when it’s time to do the craft. And, it’s a great thing to have on hand in case it’s rainy at the beach, or as an activity to do when the mood strikes or time opens up unexpectedly. Tip: If you’re making a bunch of kits for a group of kids (birthday party, class, etc. ), cut/prep the materials first (hole-punch the bowls, cut squares of tissue paper, cut the twine & ribbon, and staple the wide ribbon to the cupcake liner). Then pack the bags assembly-line style. Tip: For a group of kids, you can have bowls filled with Elmer’s glue (water it down just a tad) for them to share and a paintbrush for each kid. OR instead (and to minimize the mess) you could just use markers instead of gluing the tissue paper to decorate the bell. They can overlap pieces, paint more Mod Podge or watered-down-glue and add a few more pieces. Once done, they’ll need to wash off the paintbrush (will need it once more) and let the tissue paper dry (about 15-20 minutes depending on how much glue was used). 3. If you have time for a snack, Jello would make for a tasty way to show the texture of a jellyfish (and that it’s 95% water)! Here’s a homemade recipe from Super Healthy Kids using fruit juice. You can tell them that the “bell” they just made from the bowl and tissue paper would be squishy in a real jellyfish and feel like Jello. From there, kids can show off their tying skills (or work on them!) by tying each piece of curling ribbon onto the 8 holes. And last but not least, they can glue on the cupcake liner to the inside of the bowl. This represents where the mouth is and the oral arms that surround it. The oral arms help to bring food into the mouth and are found in many, but not all, jellyfish. Once dry, you can use a pencil or your finger to gently wrap the wired ribbon (oral arms) around it to give it a bit more lifelike look! With everything assembled into kits ahead of time, it makes the craft event so much simpler to coordinate and a ton of fun! Not only is it a blast, but it’s a truly interactive way for kids to learn about the amazing jellyfish. P.S.- Want to pin this on Pinterest to save for later? Click here! Previous Post Spark Change for a Healthy Ocean! Looks like fun for the kids AND they get to learn about these interesting creatures!